Before Apple introduces its next iPhone, its engineers may want to take a look at some research from Rice University on smartphone antennas. The Rice researchers--Ardalan Amiri Sani, Lin Zhong, and Ashutosh Sabharwal--have discovered that the key to better smartphone signal performance lies in equipping the mobiles with four antennas instead of one. "Current mobile devices, such as smartphones and laptops, are omnidirectional and radiate power to all directions for uplink transmission," the trio explained in a paper they'll be presenting next month in Chicago at MobiCom 2010. "Omnidirectionality not only introduces interference between peers, but also leads to power waste," they continued. "Emerging smartphone applications, such as participatory sensing, media sharing, mobile health monitoring, and video chat, are increasingly employing the uplink. Therefore, the mentioned interference has become a key bottleneck in the capacity of infrastructure networks with a large number of mobile clients." Wireless transmission is one of the most power-hungry activities on a mobile device and a major barrier to wider adoption of the mobile Internet, they argued. To make matters worse, the farther a device is from a base station or access point, the worse its upload data link, because most of its limited transmission power is radiated in useless directions. 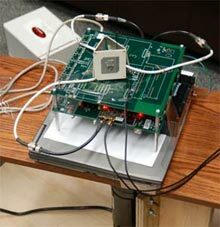 What the trio did was attach three passive directional antennas and an omnidirectional antenna to a WiFi transmitter. The directional antennas were used for transmission; the omnidiectional one for reception. The whole shebang was mounted on a motorized spinning platform so they could test the strength of the contraption's connectivity. Their experimental setup isn't something you'd put in your pocket or leave in close proximity to children. Rather than transmit in all directions, as does the antenna in a typical cellphone, the directional antennas transmit in a more narrow band. The trick is to determine which antenna to use based on the phone's orientation. The researchers figured out how to do that and came up with some impressive results. They achieved an 85 percent increase in antenna performance, as well as 51 percent reduction in power consumption.